Japanese Episode 233: "Balkie and the Karate King Nobuhiko!" English Episode 524: "A Tyrogue Full of Trouble!" Satoshi-tachi are on their way to Chouji Town when they encounter a Balkie looking sad and alone. The Balkie steals some of Takeshi's pokemon food and runs off, so Satoshi-tachi chase after it. During the struggle, a boulder is knocked down from a mountaintop, but the children are saved by a man in a karate gi. The man, who introduces himself as the Karate King Nobuhiko, informs Satoshi-tachi that the pokemon is a troublemaker famous in the area. He tells them that the Balkie was abandoned by its trainer, so it is very self-reliant and doesn't accept help from anyone. Nobuhiko wants to catch the pokemon to use in the Pokemon Grand Prix, so Satoshi-tachi decide to help him achieve his goal. The pokemon is eventually found and wins a battle against Nobuhiko's fighting-type pokemon, so that prompts the Rocket-Dan to try to steal the fighting-type pokemon! Nobuhiko jumps up to the Rocket-Dan's Nyasu balloon and punctures a hole in it, causing the Rocket-Dan to blast off. The Balkie notices Nobuhiko's kindness and agrees to a rematch, only this time Nobuhiko battles without pokemon! Battling Balkie as if it was another human, Nobuhiko manages to win both the match and the Balkie's respect. The pokemon accepts the Karate King as its master, and Nobuhiko departs to participate in the Pokemon Grand Prix. Well, we had an episode with a really good plot followed by a episode. You win some, you lose some, I guess. I don't want to come off as being overly-negative here. I mean, it's nice that they featured fighting pokemon again, as there aren't that many episodes featuring the little powerhouses. And it's good that they made a reference to the Pokemon Grand Prix from back in the Kanto Region. But after watching this episode, I feel a bit empty. Neither Satoshi, Takeshi, nor Kasumi gained anything from this experience. They didn't learn anything about the world of pokemon or anything about being better trainers. Shoot, they didn't even battle all that much--they just kinda sat in the background, watching Nobuhiko do all the work. Even though this episode features a game character, it's still a filler in its purist form. 4Kids did a little bit better with the music in this episode than they did with the last one, as they kept more of the Japanese music intact. Nintendo of America's nonsensical name change from one Japanese name to another is something we've seen before (hi, "Kimono Girls"! ), but it still doesn't make any more sense now than it did back then. What's the point, really? Pokédex: "Tyrogue, the scuffle pokemon. Tyrogue is the evolved form of Hitmonlee and Hitmonchan. It has a small but very energetic body." Sorry, but it looks like Professor Oak needs to make a correction in his Pokédex. Tyrogue evolves into Hitmonchan or Hitmonlee, not the other way around. Balkie will evolve into a Ebiwaraa at Level 20 if its attack is lower than its defense, a Sawamuraa if its defense is lower than its attack, or a Kapoeraa if its attack is equal to its defense. Yeah, it's a nitpicky and geeky observance, but it's a mistake that wasn't there originally. It's a later Jouto League episode, so you know there's going to be a commercial break-related cut, right? Of course you do. This time, the repeated scene that got cut occurs right after Nobuhiko congratulates his Sawamuraa and Ebiwaraa on a battle well fought. We see a pan of Nobuhiko and Balkie, and then we see a close-up of Balkie. Really, you're not missing anything at all. Ginga o kakeru Roketto-Dan no futari niwa! And make it double cuz we really can't stay. POW! To protect the world with a mean right hook! WHAM! To unite all people with my kickboxer look! To extend your arms and punch out your lights. And~Team Rocket's the winner at the speed of light! So surrender at once cuz we've just won the fight. 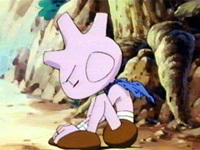 In the Japanese version, the 1998 remix of Mezase Pokemon Master is played during the fight between Nobuhiko (without his pokemon) and Balkie. In the American version, some generic, non-descript 4Kids music is played. Eh, no big deal, as the song was just kinda there, but it at least made one of the series' only battles between a human and a pokemon seem special.